Using technology to promote human flourishing. Dana is the Founder & CEO at Evolutionary Guidance Media in NYC. An award-winning psychologist, professional futurist, designer, writer, and artist, Dana explores how we can use information technologies and new media to promote human wellbeing and planetary flourishing. From digital altruism to the Cyberhero archetype, collaborative heroism to cyber-kindness, Dr. Klisanin’s pioneering research has forever altered the way we think about technology and human values. Dana’s early interest in using technology to improve human life, tackle global challenges, and transform consciousness, led her to design a framework for creating social impact media. Her transdisciplinary interests led her to the field of game design. Through forming strategic partnerships with nonprofit organizations, she's in the process of launching Cyberhero League, a locative, edtech gaming quest with real world consequences. Dana has published journal articles and book chapters on a broad range of topics, including the future of media, conscious design, mindfulness, altruism, and heroism in the digital age. She speaks Internationally and has been quoted and interviewed by numerous radio and news outlets including, BBC, TIME, Fast Company, Psychology Today, Huffington Post, USA Today, Futurist Magazine, Harvesting Happiness, Civilination, and The New Existentialists. She is Executive Director of the MindLAB at c3: Center for Conscious Creativity and Executive Board Member of the World Futures Studies Federation serving as the President's envoy to the United Nations. In 2017, Dana received the President's Outstanding Women Futures Award from the World Futures Studies Federation, and in 2012, she received the Distinguished Early Career Award for Scientific Achievement in Media Psychology for research on digital altruism and the Cyberhero Archetype. Author of numerous peer-reviewed journal articles, Dr. Klisanin is currently writing a new book, The Good Web: Hacking Consciousness in the 21st Century, explaining how information technologies are being used to improve human life and benefit the world. She recently contributed to a new Handbook of Heroism and Heroic Leadership and two book series, titles include, The Future of Business; A Very Human Future; The Walking Dead Psychology: Psych of the Living Dead, Star Wars Psychology: Dark Side of the Mind, and Game of Thrones Psychology: The Mind is Dark and Full of Terrors. Dr. Klisanin's exploration of the use of digital technologies for advancing spirituality has been translated into Russian at Eros & Kosmos. Her blog is Digital Altruism at Psychology Today. Dr. Klisanin's first foray into game design, Cyberhero League, is an interactive gaming adventure with real world consequences. The project is garnering recognition and awards pre-release. Founder and CEO of Evolutionary Guidance Media R&D, Inc. Dr. Klisanin consults on a wide variety of media projects including print media, commercials, films, video games, immersive theatre, VR / AR, and the convergence of these sectors for a variety of Fortune 500’s and NGOs. Utilizing the transdisciplinary EGM-Integral model, the consulting service provides a variety of services, including narrative overview, custom psychological assessments with quantitative scoring and qualitative review, and priming techniques to help media makers and content creators move forward with confidence. As Executive Director of the c3:MindLAB at the c3:Center for Conscious Creativity, Dana focuses on bringing emerging findings in creativity and innovation theory, consciousness studies, transpersonal psychology and integral studies into synergistic relationship with the arts, media and communication technologies. The c3: Center for Conscious Creativity is a 501(c)(3) non-profit arts and transmedia interdisciplinary research, education and project development organization founded in 2004 to provide artists, media makers, content creators and other interested individuals, a platform and resources to create projects and explore how consciousness, creativity, emerging culture, entertainment and communication technologies can help create a better world. Dr. Klisanin partnered with Dr. Lee Rowland (University of Oxford) and kindness.org to explore kindness in cyberspace. They found that in contrast to the widely reported negative aspects of human behavior online, a growing body of research is exploring the use of the Internet for spreading and facilitating prosocial behavior. The survey (n=1013) investigated the prevalence of altruistic and kindness-based online behavior, termed cyber-kindness. Motivations for cyber-kindness and the relationship between online and offline kind behavior were also explored. Results show that cyber-kindness is widespread within this sample, and is predominantly driven by other-oriented motivations as well as by a transpersonal sense of identity. Non-correlational self-report data provides evidence for a positive relationship between online and offline kindness. Limitations of the current study are discussed and we conclude that the phenomenon of cyber-kindness merits further empirical investigation. Dr. Klisanin is currently investigating the impact of digital technologies, cloud computing, and social media on heroism through exploring interactive efforts to save lives, eradicate deadly diseases, and improve the human condition. Dr. Klisanin's previous research found that individuals who consistently and conscientiously use the Internet to help other people, animals, and the environment represent a new archetype: the cyberhero (Klisanin, 2012). Her recent research, drawing upon Dr. Phil ZImbardo's theory of the “heroic imagination" finds that cloud computing has profoundly impacted the mythic and moral spheres—giving rise to collaborative heroism (Klisanin, 2013). Her current research in this area is published in The Handbook of Heroism and Heroic Leadership (2016). Millions of people are using the Internet to act altruistically: from adding content to educational websites, like Wikipedia, to donating unused computing time to help researchers find cures for diseases; from playing online games that feed the hungry, to clicking, or watching videos, that donate to charity, etc. Dr. Klisanin's research in digital altruism reminds us that the best aspects of human nature are present online. (Klisanin, 2011). 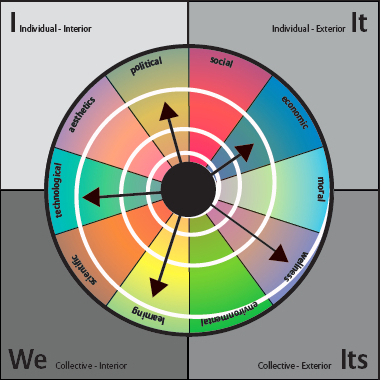 An ever-evolving model, EGM-Integral is a transdisciplinary model that brings together evolutionary systems design and integral theories for the purpose of supporting the "conscious creation, use, and evaluation of media that aims to guide the evolutionary development of body, mind, and spirit, in self, culture, and nature" (Klisanin, 2010). Dr. Klisanin is currently completing The Integral Medium: An Inventory of Possibilities, a contemporary spin-on the McLuhan & Fiore's classic. The book is highly visual and designed to bring her research to "conscious creatives" and anyone interested in using the power of new media to co-create a better world.